Using Spin-Clean as directed, you can expect to clean up to 700 records with the 4 oz. bottle, up to 1400 with the 8 oz. bottle, up to 2800 with the 16 oz. bottle, and up to 5600 records with the 32 oz. bottle. Remember to use only one (1) capful of fluid with the 8 oz., 16 oz., and 32 oz. bottles of Record Washer Fluid. When using the 4 oz. bottle, you should use three (3) capfuls of fluid. The Spin-Clean Record Washer Mark II's real effectiveness comes from its ability to impeccably clean both sides of any record simultaneously without using your turntable as part of the process. The "heavy lifting" is accomplished through Spin-Clean Record Washer MKII's unique washer fluid. This special formula encapsulates the dirt that comes off the record from deep within the record grooves and sinks it to the bottom of the washer basin. Yes! Spin-Clean has been on the market for 40 years, used worldwide, and lauded by record collectors, libraries, radio stations, the Library of Congress, and audiophiles everywhere. Maven Gifts provides you with only the most durable and well-designed items. You can always rest assured that your items will come as expected, featuring high quality construction and well detailed designs. We take pride in our items and selection for you. 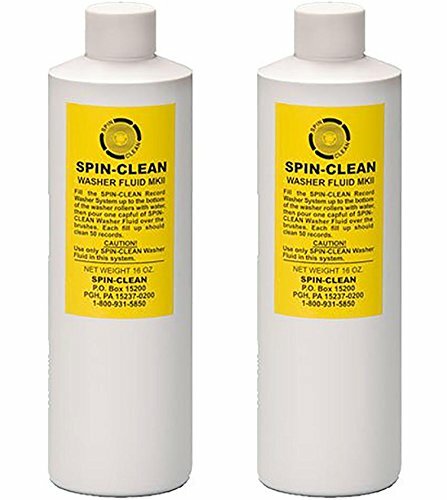 This package includes (1) Pack of 2 Spin Clean 16 oz Wash Fluid. CLEAN YOUR COLLECTION: Using Spin-Clean as directed, you can expect to clean up to 700 records with the 4 oz. bottle, up to 1400 with the 8 oz. bottle, up to 2800 with the 16 oz. bottle, and up to 5600 records with the 32 oz. bottle. Remember to use only one (1) capful of fluid with the 8 oz., 16 oz., and 32 oz. bottles of Record Washer Fluid. When using the 4 oz. bottle, you should use three (3) capfuls of fluid. EASY CLEANING PROCESS: The Spin-Clean Record Washer Mark II's real effectiveness comes from its ability to impeccably clean both sides of any record simultaneously without using your turntable as part of the process. The "heavy lifting" is accomplished through Spin-Clean Record Washer MKII's unique washer fluid. This special formula encapsulates the dirt that comes off the record from deep within the record grooves and sinks it to the bottom of the washer basin. TIME TESTED: Yes! Spin-Clean has been on the market for 40 years, used worldwide, and lauded by record collectors, libraries, radio stations, the Library of Congress, and audiophiles everywhere. PRODUCT SPECIFICATIONS: This package includes (1) Pack of 2 Spin Clean 16 oz Wash Fluid. If you have any questions about this product by Spin Clean International, contact us by completing and submitting the form below. If you are looking for a specif part number, please include it with your message.